Locker Organizer Without Tubs Features Two-Double Coat Hooks In Each Locker Space To Conveniently Hang Jackets, Backpacks And More. 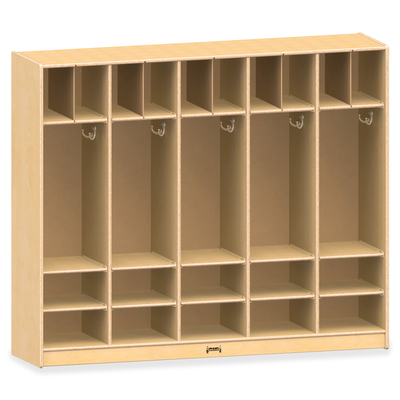 Two Cubbies Below Each Locker Are Large Enough To Store Shoes, Mittens And More. Mail Slots Above The Locker Area Are Perfect For Message And Homework Management. Kydzsafe Rounded Edges Allow Children To Play Safely Without Getting Hurt By Sharp Edges Or Corners. Kickplate Prevents Children From Losing Small Items Underneath. Dowel-Pin Construction Prevents Weakening At The Joints. Ultraviolet Acrylic Coating Is Durable And Resists Yellowing Over Time..
Locker Organizer Without Tubs Features Two-Double Coat Hooks In Each Locker Space To Conveniently Hang Jackets, Backpacks And More. Two Cubbies Below Each Locker Are Large Enough To Store Shoes, Mittens And More. Mail Slots Above The Locker Area Are Perfect For Message And Homework Management. Kydzsafe Rounded Edges Allow Children To Play Safely Without Getting Hurt By Sharp Edges Or Corners. Kickplate Prevents Children From Losing Small Items Underneath. Dowel-Pin Construction Prevents Weakening At The Joints. Ultraviolet Acrylic Coating Is Durable And Resists Yellowing Over Time.